Have you ever wondered why housing inventory is so low? Although there are areas of the country where inventory appears to be lower and selling quickly, lack of inventory isn't an issue when smart agents offer to help their prospects understand that now's a great time for them to move. The size of the boomer generation is about even with the millennials, making these two groups dominant in the housing market. And while many boomers whose children have now grown and moved out may not have an immediate need to sell, it's inevitable that downsizing will be in their future. In fact, a recent survey from the National Association of REALTORS® reports that 85 percent of older boomers are hanging onto their big houses, and millennials are now indicating that they, too, aren't anxious to sell their homes. Add to the mix the inadequate addition of new construction over the past 10 years, and we have a problem. This stagnation of housing transition negatively impacts the ebb and flow of inventory, making it tough to get listings. So, how can we help boomers make the decision to move? Since the market has been healthy for the past several years, many boomers aren't aware of the benefits associated with moving into their forever home* while the market has willing buyers. When prospecting this market vertical, the question to ask is simple: "Do you think interest rates will go up or down?" With the anticipation of rising interest rates and the slight increase in inflation, providing different options can help sellers see that it may be the perfect time for a move. When a prospective homeowner understands their options to downsize to a smaller home, relocate to a different climate, free up dead equity to purchase a second home, refinance their present property, or make a decision that fulfills their lifestyle, you've opened the door to getting more listing inventory. When teamed up with your lender partner to review finance options, you become a valuable resource to help navigate a timely window of opportunity. You and your lender partner can help them make their best real estate decisions based on several factors, such as the real cost of money, the value of moving up or down, and/or the cost of staying put. 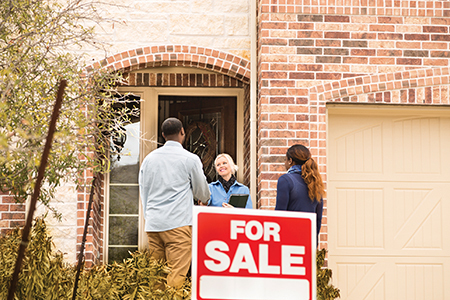 Other options for securing more listings require talking to more people. Target For Sale by Owner property owners and follow up on expired or withdrawn listings. Set up an introduction with estate attorneys to work together on estate properties that come up during the year. Even open houses offer an opportunity to meet buyers who may have to sell before buying their dream home. If you aren't convinced that inventory is available, run the numbers in your local MLS and see how many properties have been listed in the past few months that are currently under contract. People are moving! Real estate is driven by life changes: marriage, divorce, job relocations, upsizing, downsizing and everything in between. Don't buy into the belief that there's no inventory. Be the agent who focuses on how to provide the ultimate value to get more listings by providing relevant value and services, and be their REALTOR® of choice. *For a complimentary podcast on forever home strategies, please visit https://bit.ly/2GygQ2W.